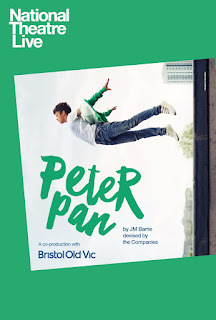 Following its hugely successful run at the National Theatre, “NT LIVE: Peter Pan” hits cinemas nationwide for a special one-day event. Directed by Sally Cookson and co-produced by Bristol Old Vic, the wondrously inventive production of J. M. Barrie’s cherished tale will be shown at 11:00 AM local time on Sunday, June 11, 2017, from Fathom Events, BY Experience and National Theatre Live. BY Experience kicked off the digital revolution of live events to movie theaters and other locations globally with David Bowie’s 2003 Reality album launch and since then, over 30 million tickets have been sold worldwide for cinema events BY Experience has distributed globally. Current cinema series credits: Distribution Representative, The Met: Live in HD (Worldwide; since 2006), the UK’s National Theatre Live (Ex-UK; since 2009), Bolshoi Ballet (North America; since 2014). BY Experience has executive produced and/or distributed several diverse programs for cinema including numerous rock concerts, radio programs, fine art exhibits other special content events including national theatrical re-releases of classic and in some cases fully restored films such as “The Breakfast Club” (30th anniversary), “My Fair Lady” (50th), “Oklahoma!” (60th), and “Fantasia” (75th). BY Experience distributes to over 70 countries, to over 3,000 movie screens. For more information, visit www.byexperience.net. National Theatre Live launched in June 2009 with a broadcast of the National Theatre production of Phèdre with Helen Mirren. The company has since broadcast more than 50 other productions live, from both the National Theatre and from other theatres in the UK. NT Live broadcasts have now been experienced by over 6.5 million people in over 2,500 venues around the world, including over 700 venues in the UK alone. Past broadcasts from the National Theatre have included Danny Boyle’s Frankenstein with Benedict Cumberbatch and Jonny Lee Miller; War Horse; Man and Superman with Ralph Fiennes; and most recently Twelfth Night with Tamsin Greig. Broadcasts from other UK theatres include Les Liaisons Dangereuses and Coriolanus from the Donmar Warehouse; A View from the Bridge from the Young Vic; Macbeth from the Manchester International Festival; and Hangmen, Skylight, The Audience and No Man’s Land from London’s West End. The biggest single broadcast to date is Hamlet with Benedict Cumberbatch at the Barbican, which has been seen by over 600,000 people. In 2014 the National Theatre recorded its first production on Broadway, Of Mice and Men with James Franco and Chris O’Dowd, captured at the Longacre Theatre.